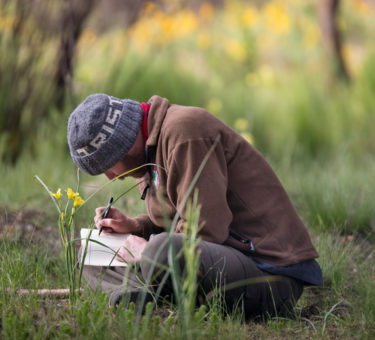 Supports matric students on the Matric Enwild, to connect with their dreams and visions through facilitated mountain wilderness trails. 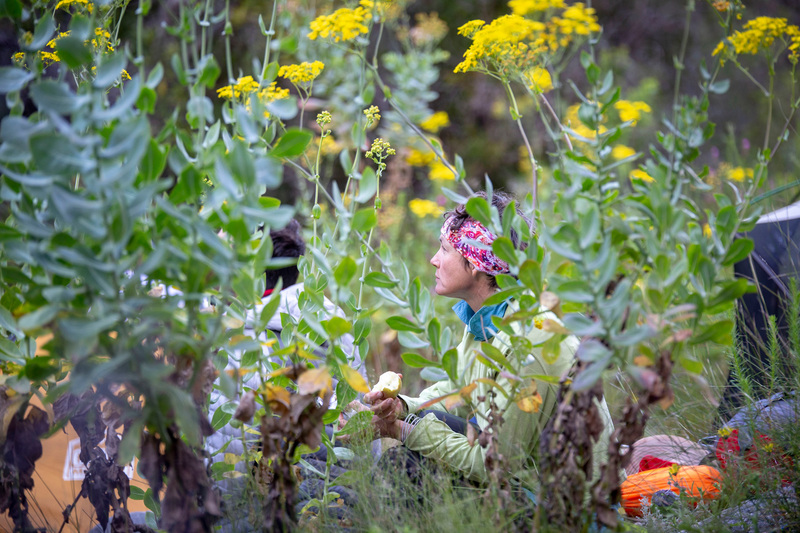 Funds rural farm children to access educational experiences in the Cape Mountains, to learn about nature first-hand. Provides free use of hiking gear on an application basis to anyone who needs it, through Gear for Good. 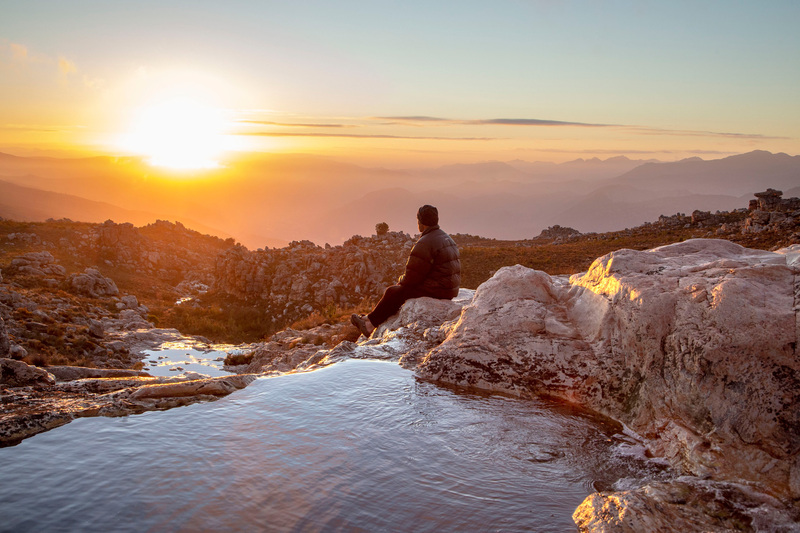 Beyond all our projects, we are simply in love with a long, rugged line of wild peaks and valleys, stretching some 650km from the Cederberg in the north, to the Outeniqua foothills in the east, forming the south-western rim of the African continent. 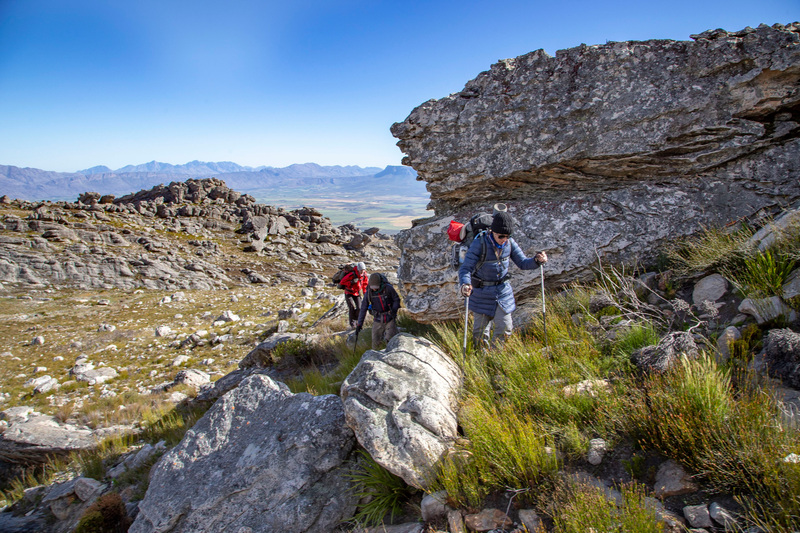 This demanding hike – our annual fundraising event, is a full traverse of the Cape Fold Mountains, and is divided into 9 stages each varying between 6 or 8 days in duration. Join us for just one stage, a combination of stages, or all stages linked to make one journey called a Thru-Hike. The traverses for 2019 take place between 24 September and 18 November 2019. Some days will be very difficult or challenging as we walk through thick vegetation, over rough rocks and along old trails, in searing heat one moment and cold winds, or rain the next. It is not about distance covered, although we will hike far. It is not about any fastest known time, we take our time, but we also move at a pace that demands good fitness and enthusiasm for adventure. The Rim of Africa route is suited for experienced and fit hikers, who are looking for a different and meaningful hiking experience. We are not offering a packaged or tame adventure. We are experienced mountain guides in love with these wild places. We are there for navigation and safety with support and knowledge. You are responsible for your own food and preparation, while we supply tents and expertise. Read the FAQs here. Because we only live once, and experiences count. Besides, mountains are a beautiful wild refuge where the journey of our life takes on new meanings. Prepare in advance, train, and know your own abilities and limitations before applying and you will get the most from this unique opportunity. Please note our terms and conditions. 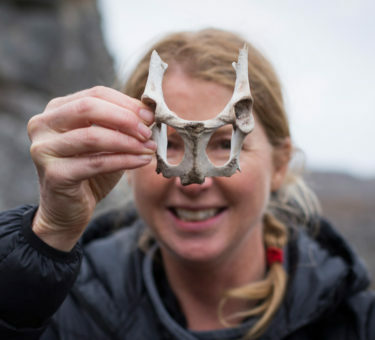 You are invited to apply and join us for the 2019 traverse. Why am I walking here on this high mountain of experience? Why am I walking here where the sharp jagged edge of attaining this place has out-worn my weary limbs? What am I doing here cradled above the free-falling stream where small, high-pitched discomforts flutter among the thick vegetation like bird song, perch momentarily and then are lost within the low dense entanglement of diversity? All that is up here feeds on this mountain. Even each delicately red Erica, each patch of damp, green moss, each brightly spirited sunbird and each pool of silent water. Each industrious black ant building light, fibrous nests consumes its daily ant-sized portion of the mountain’s weighty bulk. All that is up here feeds on this mountain, bit by tiny bit. Yet the furrowed quartzite ridges of the mountain’s wide brow are unworried. The mountain generously sacrifices itself, quietly offers gifts to each small, brief spark of bright life that is up here. All that is up here feeds on this mountain and thrives. Even the clouds gather to feed around the peaks and grow their thunder skywards. The late afternoon light nourishes itself on the folded yellow-greens of the valley slopes. Space itself expands upwards and outwards from the airy depths between the mountain’s high places of realization and its deeply buried roots. Why indeed are we walking here? Is it like the Ericas, the birds and the ants, like the clouds, the light and the space, that we too are drawn here by quiet gifts of nourishment to feed on this mountain and thrive? We are not tourist guides or mountain guides in the traditional sense. We are people who have grown competent in our love for these mountains. We are not offering a packaged, tame experience. We are inviting you to embrace the Rim of Africa ethos and to join us, if that inspires you. We believe in the power of these mountains for good. We have long wondered: How can we truly share the Rim of Africa experience? We have tried different things. We are learning. We are exploring. This is an experience, and one we all cherish each time we walk it. The Rim of Africa happens once a year in springtime. Places on this experience are limited. We invite you to apply for one of these places. The Rim of Africa is not for economic profit. But there is a cost. We strive to include people from diverse economic backgrounds, and so costs are based at varying tiers for you to choose an appropriate level of support. We make some donor funded places available. 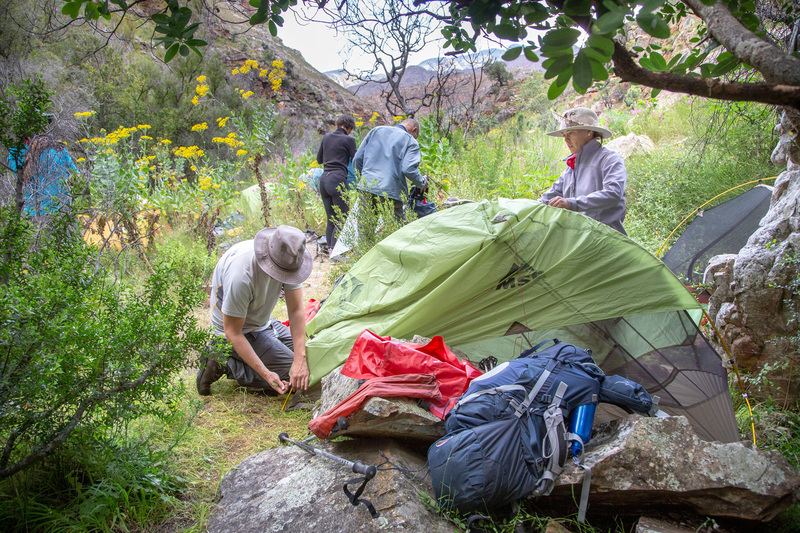 If there is a space for you this year, you can join the Rim of Africa community, starting your thread of the story at Pakhuis in the Cederberg. You choose how much of the journey you want to hike. You may choose to hike multiple years in a row, slowly completing each of the 8 stages of the route. Although the route we follow is generally the same each year, as this is a wild traverse much of it is off-path and so we vary our journey as required. This is the allure and appeal of the Rim of Africa as a mountain experience – it is always different. Take a look at each traverse offering below. Note the dates of each section and apply for your place. A classic on trail section with unique views and taking in the highlights of the Cederberg from north to south This classifies as a classic traverse of the entire Cederberg. 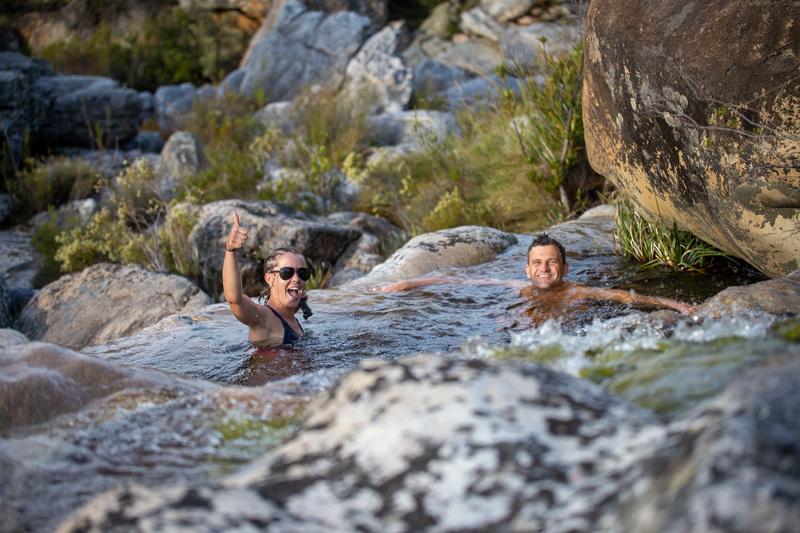 Highlights: The Cederberg is a remarkable wilderness area of rock formations, caves, rock pools and incredible vistas. A rugged terrain with rich biodiversity. This is one of the easier traverses and suitable for all levels of hiking fitness. 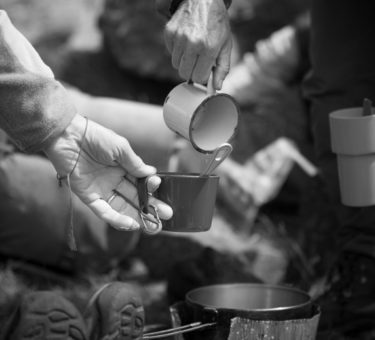 Camps: Wild camping, bucket washes. Hiking Grade: Fairly Strenuous. Two main climbs to ascend. One of our most loved sections as we enter private land that takes us up some of the region’s most remarkable peaks. You will be forgiven for thinking you are in the Drakensberg. A tough traverse or two followed by a gentle descent to camp on the last day. 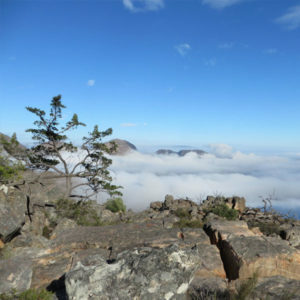 Highlights: Discover the real gems of the Kouebokkeveld, remarkable rock formations, secret valleys, towering peaks and views you never imagined possible in the western Cape. Terrain: Mountainous, some steep gradients, off-path, technical. Camps: Wild camping, bucket washes, no fires. Skurweberg is full of unexpected dimensions. A mixture of off-path and beautiful ridge-line track. Terrain: Mountainous, some steep gradients, off-path. 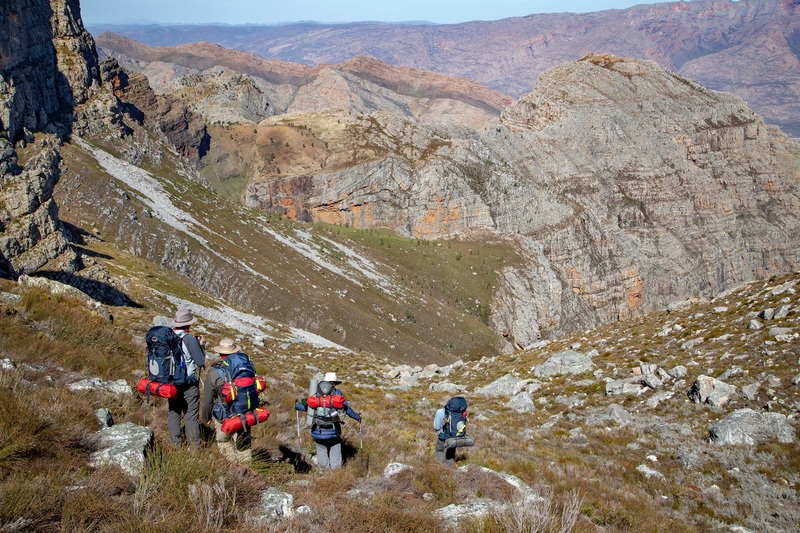 A unique opportunity to traverse the formidable Hex River Mountains. Vast amphitheaters of rock and rich vegetation with extensive views. Highlights: This section traverse is one of everyone’s favourites. 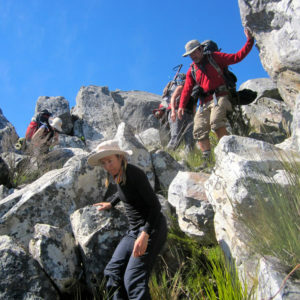 It includes incredible hiking off-path with a technical descent into the Hex River Valley. Sleeping in the shade of a vast amphitheatre with a waterfall shower. And second steep ascent with incredible scenery and rich Fynbos eventually lead us into the Klein Karoo and its gems. 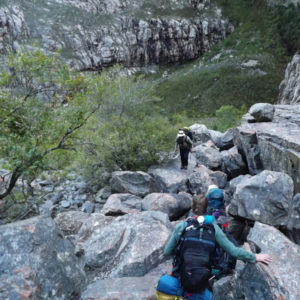 The ultimate ridge-line hike, from the Koo Valley to Montagu. Experience the thrill of walking in the sky, as we navigate well vegetated ridges and extensive views, on a clear day as far as the ocean. Highlights: This traverse is out of this world – literally. Great fusion of hiking and scrambling through protea and mountain fynbos with incredible views for days on end. Starting in the historical architectural gem of Montagu, with an initial ridge-line hike that makes way to a superb contour path with views over the vast Klein Karoo. Ending in the nature reserve of the Grootvadersbosch. Terrain: Mountainous, some steep gradients, mix of on & off-path. From the Tradouw River through the Grootvadersbosch nature reserve via exceptional ridge line down into the Gysmankloof and past the famous Sleeping Beauty ending outside Riversdale. 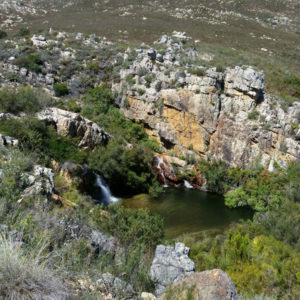 Highlights: The indigenous forests of Grootvaders- and Bosmansbosch, an exceptional ridge line and forgotten trails through remote protea covered valleys. Terrain: Mountainous, some steep gradients, on & off-path. Following the final stretch of Langeberg from Garcia’s to Cloete Pass, through hidden valleys fynbos covered slopes, crossing trading routes of days gone past. Ascending high mountains, passing green pastures and wading across the Gourits river. 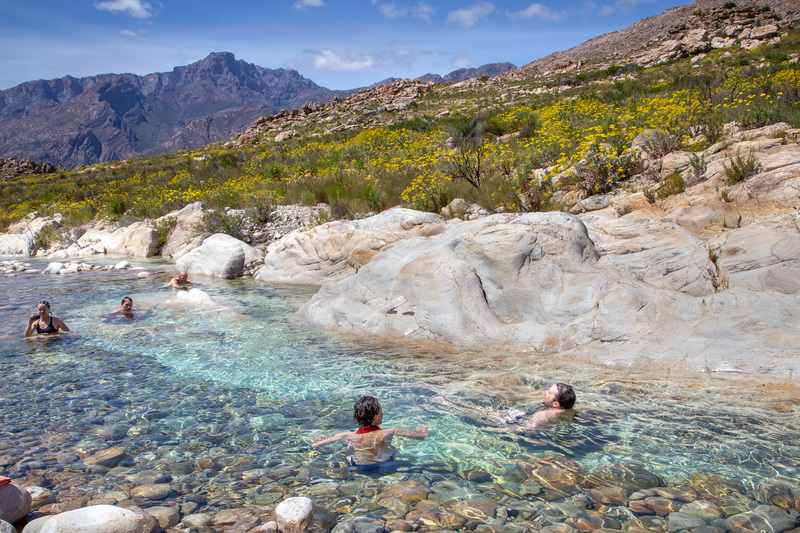 Highlights: The remoteness of the East end of the Langeberg with its crystal-clear streams and protea covered passes. 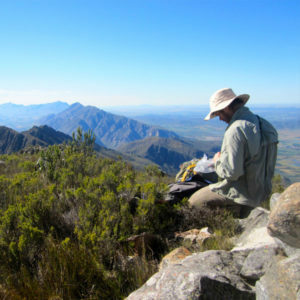 Unique mountain tops with views of Swartberg to the North and the Indian ocean just 50km south. 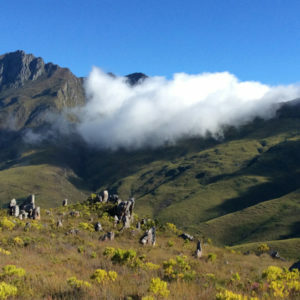 From Cloete Pass, this final traverse takes you on old farm tracks through the foot hills of the Attakwas mountains and via Robinson pass and Ruitersbos nature reserve ending in the southern Outeniqua mountains West of George. 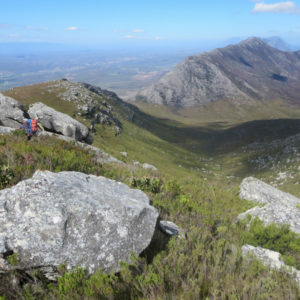 Highlights: The rolling “hills” of the Attakwas & Outeniqua Mountains know to the early Portuguese explores: Serra de Estrella (Mountain of the Star). Rugged mountain top in the Outeniqua. 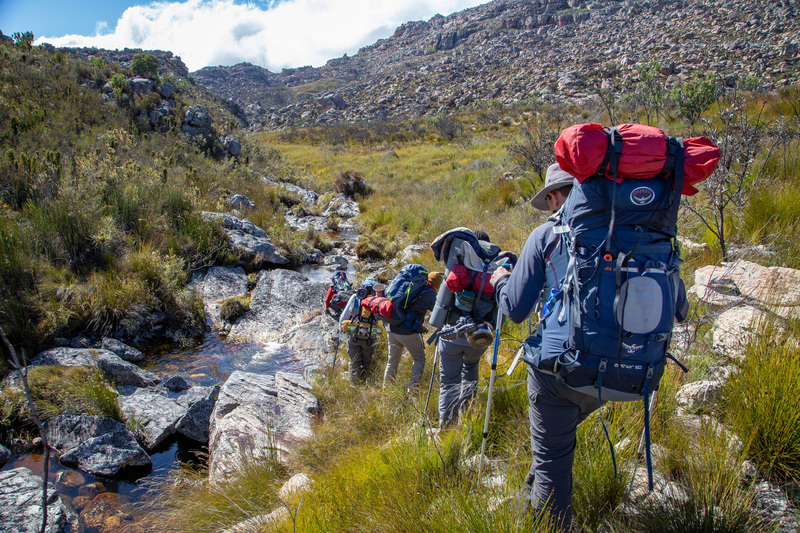 The ultimate experience 8 weeks in nature, on top of mountains, through remote valleys, along hidden long forgotten paths, from the Cederberg in the North to the Outeniqua in the East. Highlights: Endless ridge lines, rock formations, crystal clear spring water, swimming in mountain pools, sleeping under the stars. Experienced and knowledgeable mountain guides. Breath-taking vistas, crossing the Cape Floral Kingdom, afromontane forests, leopard tracks and game spotting. Proteas and bird life. Rock paintings, thoughts, impressions, blisters and pain, laughter and tears, friends, memories and personal transformation. Can I walk Rim of Africa unguided? Rim of Africa is a unique route and not an official open-access trail. We cross a vast number or private properties, and our access agreements with landowners have been built with trust over 10 years. Anyone walking on private land without a permit or access agreement will be trespassing. Must I really carry all my stuff? This is a real hike, for people who love getting deep into mountain wilderness with no comforts. You can make your pack as light as you like (within the bounds of safety). You will need to carry a shelter (we supply a super lightweight single tent for your comfort), while you bring your own cooking kit and all food you might require between resupply points. Expect to carry a pack weighing at least 15kg – 18kg. 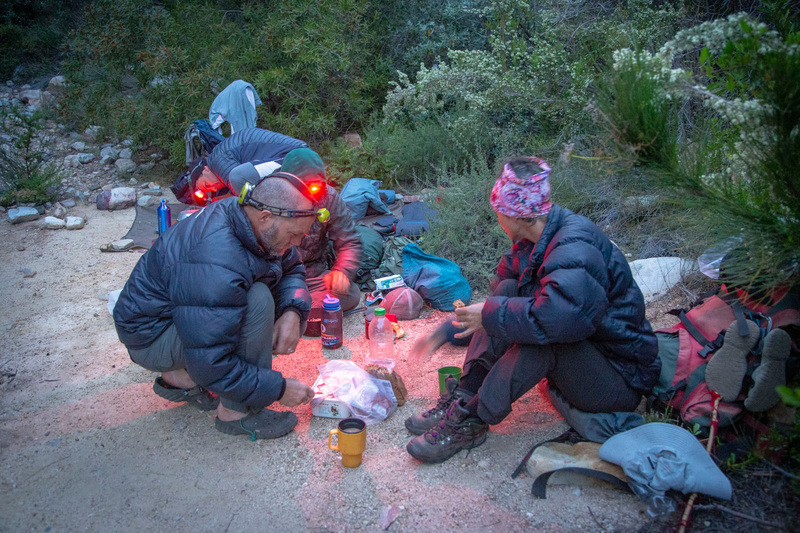 We can help you with tips on how to minimize your pack weight. Why is the route only walked in spring? Our annual traverse starts every year on 24th September and ends around 18th November. This is spring time in the Cape Mountains, the streams are flowing with fresh water from the winter rains, the flowers are in full bloom and the weather is not too hot, nor too cold. That said it can be very COLD and very HOT during this time too. 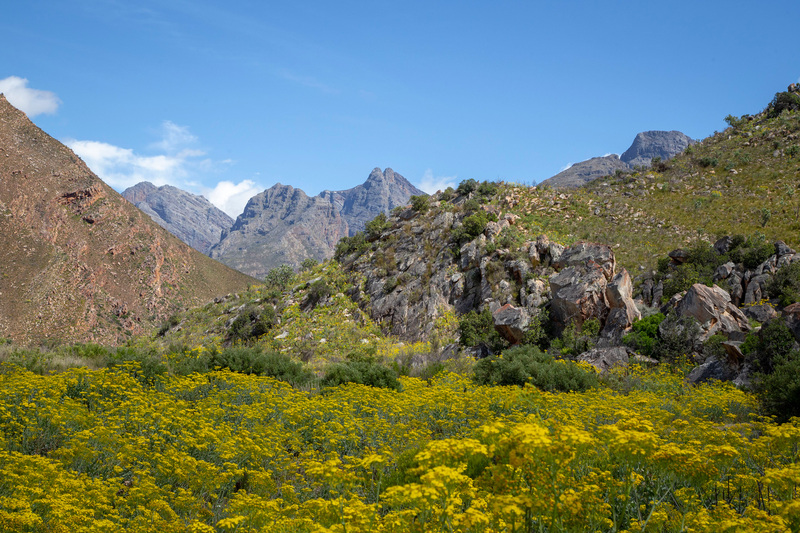 Spring is the ideal time to be out in the Cape Mountains. How do I get resupplies? Our logistic support and re-supply service is included in the participation donation. We bring your pre-packed food supplies to designated re-supply points every 3 – 5 days. We will take your trash out and bring you your pre-packed amo-boxes. You can pack anything you like in these boxes and have it available at each re-supply point, it can be clothes, extra gear, 20kg of chocolate – whatever you think you may need or might want access to at a re-supply point. We supply the amo-boxes for your convenience. We do not have a service portering your bags between camps. This is no slackpack adventure. 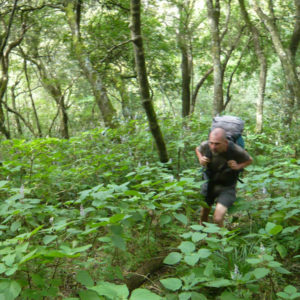 This is a self-carry hiking experience. How long is each hiking day? Each day starts at or before sunrise. We have two hours each morning before we start walking to complete ablutions, pack away and dry off tents, pack our back-packs, eat breakfast and get ready for the day. We generally start off with a simple briefing followed by some warm-up exercises before trekking onwards. We break for mid-morning tea after two-and-a-half hours, then again for lunch around midday. We are usually in camp by late afternoon. What distances do we cover? Certain days are longer than others, on average we walk anything between 8km – 21km a day depending on the terrain. Steep climbs and descents can be expected. 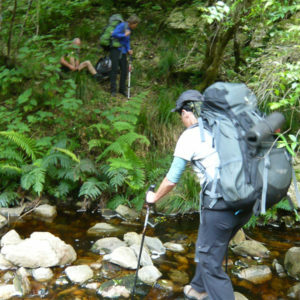 There are various sections where we walk off-path and through thick fynbos or over rocky terrain. All sections after the first 7 days of the route require agility and good balance while carrying a full pack. What about fast changing weather? Be prepared for sudden weather changes. A storm can arise any time in the mountains and cold winds can blow on the sunniest of days, so having your full wet-weather gear, fleece/layers, gloves and beanie easily accessible is essential. There is no ruling out freak snow storms and extreme cold. Cold rain and wind is common in the Cape mountains and can be the most dangerous weather of all, leading quickly to hypothermia. Hypothermia can be avoided by dressing in layers of synthetic clothing, eating well, staying hydrated, and knowing when to stop and seek shelter. At all times keep your kit dry. Weather can vary from very cold (below freezing) to very hot 40 degrees in a relatively short period of time and at any time of year. Bad weather (cold and wet) predominantly comes in the form of cold fronts sweeping across the Western Cape, with bad weather associated with a front typically lasting 3 or so days. Strong north westerly winds usually proceed a front. The coldest temperatures occur just behind the front. Several fronts in short succession mean that cold rainy conditions can persist largely without break for 2 weeks at a time. The Cape Mountains are a winter rainfall area but rain can and does occur at any time of year. August is the coldest , wettest month in these mountains. After August weather steadily becomes warmer and drier until February, which is the hottest, driest month. Snow can occur over most of the route between May and end of September. During bad weather, much of the route is above the cloud level and so visibility is seriously hampered in such conditions. Ask us more . . .
We supply state of the art light-weight MSR tents, but you are welcome to bring your own light weight tent. We have a limited number of double tents available, so if you do wish to share, please let us know as soon as possible so we can try and accommodate your request. Water availability varies from season to season and is dependent on the specific rainfall of a particular year. 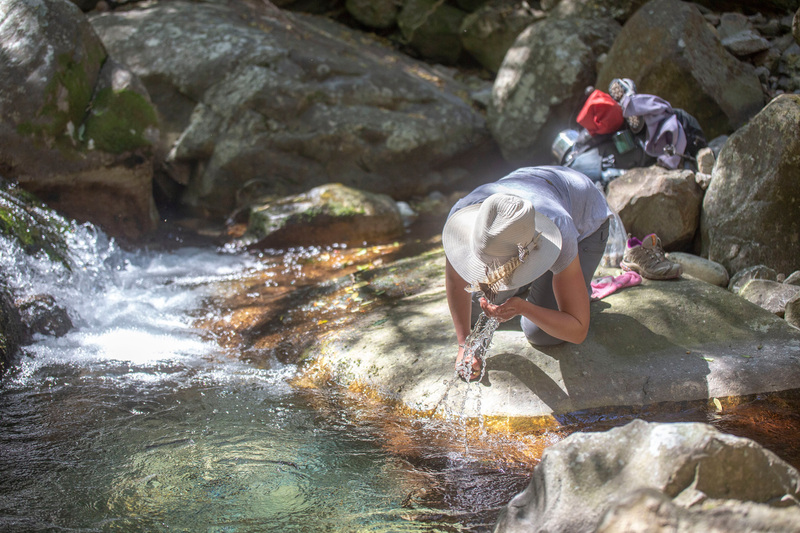 Generally there is plenty of water available throughout the route, but on some sections there can be challenges, our team of guides will ensure water is always found. After winter there is a lot of water around and this gets less as summer approaches. Water in the Cape Mountains is safe to drink. To protect it and the downstream farmers who rely on these mountain streams, please do not use soaps of any kind in the rock pools, even so called biodegradable soaps have an impact on aquatic life. We encourage alcohol-based sunscreens and not heavy cream or oily sun protection. We meet in Cape Town outside the Mountain Club of South Africa, a central point in the city, which is easy to find. From here we take a charted air-conditioned minibus, with a certified driver. The cost of transfers is included as part of the package. All transfers are supplied by an independent operator. Rim of Africa has adopted these principles to inform our mountain activities so that we “leave only footprints and take only memories and photographs”. The route we take passes through protected areas, World Heritage Sites, private farms and Wilderness Areas. 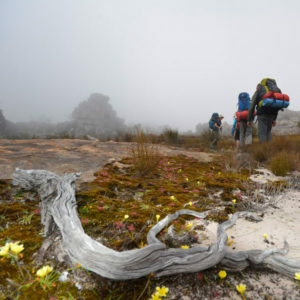 All hikers agree to respect the wildlife and the environment, and agree to obey all CapeNature Reserve rules and regulations. Never damage property of any kind, including fences, signs and buildings. If some damage is inadvertently caused, report it to your guides. Outdoor fires are strictly prohibited. Stick to paths where possible and walk in single file to avoid soil erosion. Leave any trail huts you may use in good condition. Do not litter. All rubbish, wrappers and even banana skins must be carried along until you find a suitable rubbish bin at the next Re-Supply Zone. While Banana peels and apple cores might be considered as ‘biologically degradable’ these should also be carried out and disposed of in a rubbish bin. We remove all used toilet paper in sealed ziploc bags. No burying or burning of used paper is permitted. Try not pick any plants or disturb any wild animals or their habitat. Do not contaminate rivers, water tanks, boreholes or any other water supply. Please assist us to ensure we leave the mountain areas we pass through as we found them. All those who have experienced the Rim of Africa attest to its potency. It is about immersion. In wild beauty. In serenity. In well-being. In discomfort. It is exhausting and restful. It is about height and depth, about silence and dialogue, about solitude and connecting. It is about wandering and wondering. It is enlivening, invigorating, tranquil and surprising. It is soulful, sweaty, serene and scratchy. It is spectacular and poetic. It is not really a hike. It is an act of love. It is unhurried. It endures. Entries for the 2019 season are open – and yes, places are limited. IT IS OUR TENTH BIRTHDAY! To celebrate we are offering every traverse section at 50% off the standard cost. 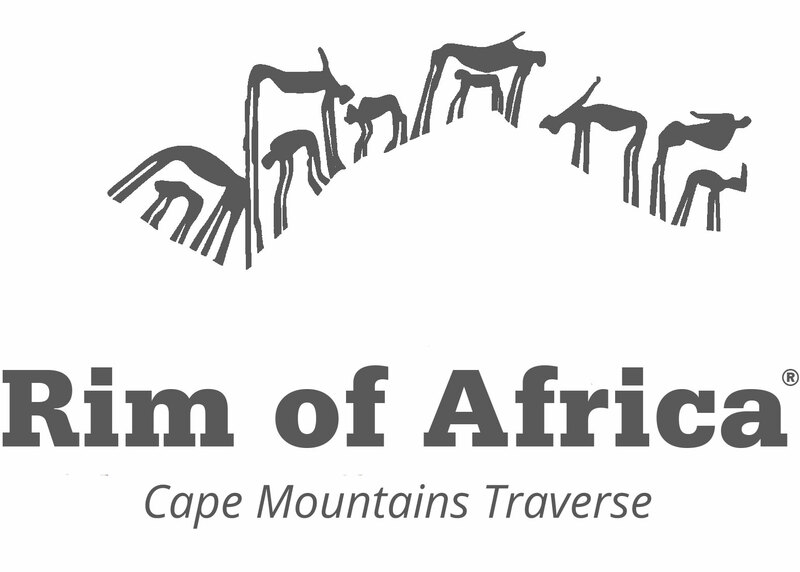 So if you have been thinking about hiking Rim of Africa – this is the year to sign-up. R395 per day + R2,000 non-refundable deposit per section. 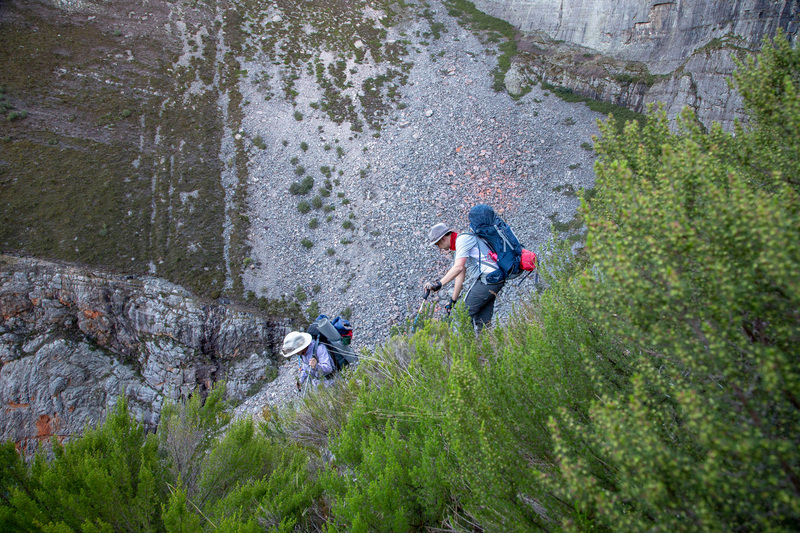 Coordinating an annual traverse of the Cape Mountains over 600km of wild terrain, takes a lot of organising. Access agreements and camping permits – are not free. 2 Professional Guides – guides are a requirement by some of our private landowners. Communications – helping you plan. Insurance – oh yes, it’s advisable. Medical supplies & satellite phone – for the unexpected. Logistics, food drops, resupply service and transfers to the start and back to Cape Town – takes some planning. Team of Organisers – 12 months of work to arrange the above and support website, financials, bookings, projects, etc. And when we divide all of that by the small groups on each traverse, it comes to a daily rate of R395 per person + a R2,000 non-refundable deposit per section or a total of just R4,765 per average traverse. Rim of Africa Matric Enwild – supporting Matric students to connect across boundaries and reach into their future. Farm & Rural School Kids in Nature – supporting local children along the Rim of Africa route to get into the outdoors. Gear for Good – addressing the urgent need for many communities to access gear for hiking & the outdoors. There is a minimum number of participants required to register before we can confirm a traverse will take place – so get your friends to sign-up with you. 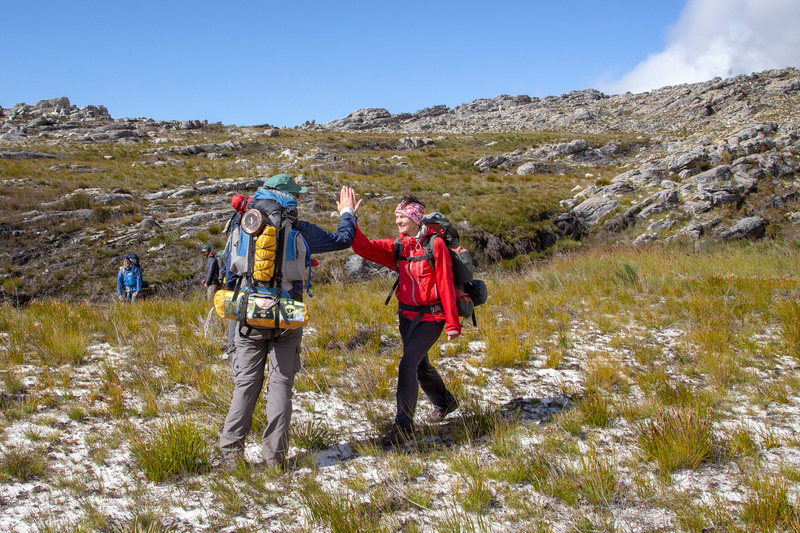 We offer 2 supported places which are partially sponsored, for enthusiasts such as students, pensioners or others who need financial support at R950 all inclusive per traverse. Details in the application form. Terms and Conditions apply. Apply here for a sponsored place. 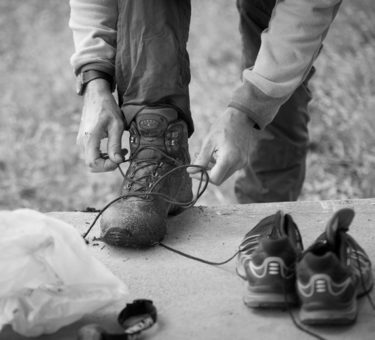 We offer two preparation hikes for hikers. 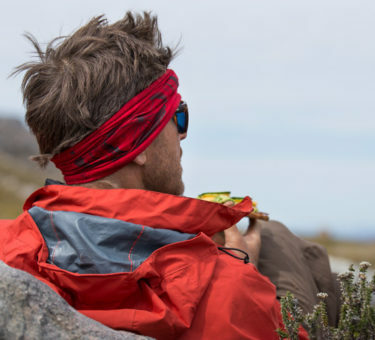 These are an important opportunity to familiarise yourself with technical off-path hiking and the correct gear you will need to successfully enjoy the Rim of Africa. Find out if this experience is really for you. Learn from our experienced guides on these weekends. 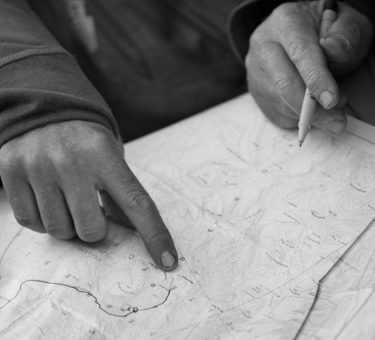 Months of preparations by a small dedicated part-time team who obtain access permission from more than 200 different landowners, answer any questions you may have leading up to the event, work to prepare logistics and coordinate transfers, scout new sections of the route, and on it goes. We are amazed ourselves how much it takes to get a group of people into remote mountains. Logistics support ( this involves your extra gear and your own pre-packed food being made available at resupply points on days 3, 4 or 5 depending on each section. This allows for your pack to be lighter than would be the case otherwise. At each resupply point you can off-load trash, restock your food, and pick up fresh gear / clothing). Amo-boxes for storing gear and your pre-packed food. 2 x Route Leaders per traverse. All access permits + conservation fees. Medical emergency pack, emergency satellite phone & GPS. Indemnity insurance for any damage inadvertently caused to private property. A small dedicated team taking care of everything along the route for you, ensuring your re-supply boxes are delivered and trash removed. The knowledge that your donation is being used responsibly. Special and memorable Rim of Africa gifts from the trail. An experience that will live on long after we reach the end of any stage, memories of wide open places, silence, pleasure, achievement, some pain and loads of good companionship. It will be tough, beautiful and amazing. 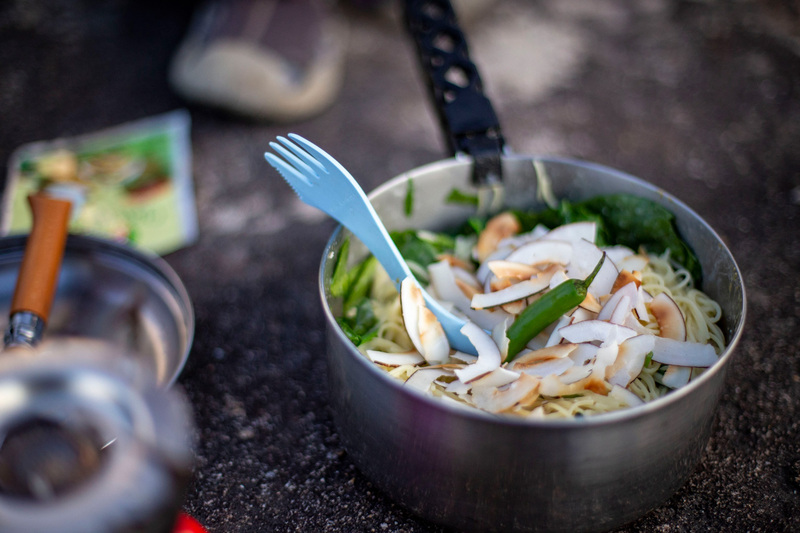 Food – you need to bring and pre-pack all your own food. This is great as it means you get to eat exactly what you love and can plan your meals according to your energy needs and preferences. 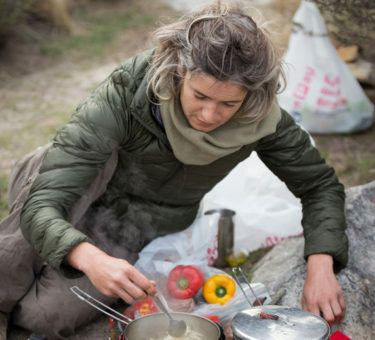 Cooking stoves – You need to have your own stove for cooking or team up with another hiker and share. Tents – We have a limited supply of FREE tents on a first come first served basis, so sign-up early. Apply today as places are limited and the more popular traverses sell out quickly. 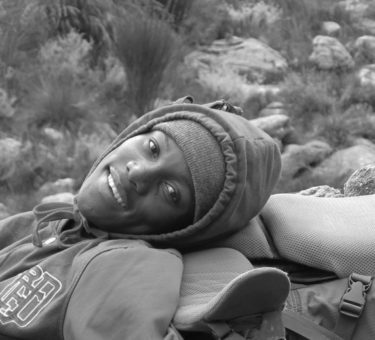 In 2012 a National Geographic Young Explorer, Jay Simpson, completed the first Thru-Hike of the rim of Africa route. Read his entertaining, informative and fun blog posts below. 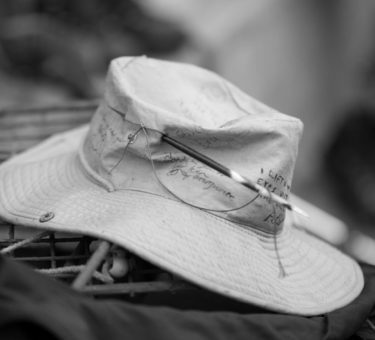 Rim of Africa Trail Journal . . .
View some of the many images taken by hikers over the years. View images in the gallery . . .